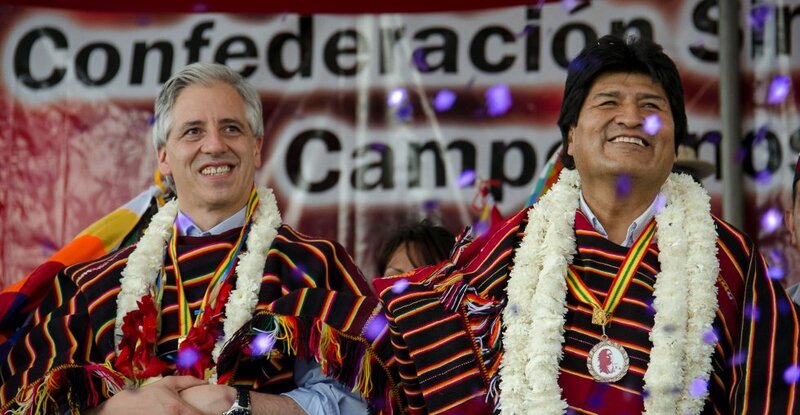 Bolivian Vice-President Alvaro Garcia Linera and President Evo Morales. The “no” vote narrowly won with 51.3% of the vote in a February 21 referendum in Bolivia held to resolve whether left-wing President Evo Morales could run again in 2019. The vote, involving an unprecedented participation rate of 90% of registered voters, was over whether to change the constitution to allow a president and vice-president to stand for re-election twice. The defeat for the “Yes” campaign means Morales, Bolivia's first indigenous president who was re-elected with a large majority under the new constitution in 2014 — will be unable to stand in the 2019 elections. The same applies to Vice-President Alvaro Garcia Linera, the ex-guerilla-turned left-wing academic from Morales' Movement Towards Socialism (MAS) party. The voting process largely proceeded without irregularities or cases of fraud. However, there were incidents of opposition-inspired violence in the department (state) of Santa Cruz, a right-wing stronghold. At polling stations in central La Paz, where support for Morales has traditionally been high, the mood of the voters reflected the relatively even voting intentions of the entire population. Speaking to Green Left Weekly at polling stations in the city, supporters of the “No” and “Yes” campaigns explained the reasons for their voting intentions. In the early stages of the counting process, the “No” vote led with 62.69%, while “Yes” trailed at 37.31%. The dramatic narrowing of the margin as counting went on can be explained by the fact that support for the indigenous-led revolutionary process is much higher in rural areas, where the vote took much longer to count. This did not stop opposition groups from starting early celebrations in La Paz and Santa Cruz. Speaking to the press on the night, amid false speculation the government had rigged the vote in favour of the “Yes” option Garcia Linera criticised the opposition's early celebrations and urged the nation to await the final results. The final results were released on the night of February 23, reflecting the closeness of the vote as predicted by major opinion polls like IPSOS. The “Yes” vote won in the three most populous departments — La Paz, Cochabamba and Oruro — but the “No” vote triumphed in the other six other, as well as many urban centres. Despite the referendum loss, Morales remains the most popular politician in Bolivia — and one of the most popular presidents across Latin America. In a recent overview of “10 years of Evo Morales”, TeleSUR English demonstrated some of the important achievements the Morales administration — first elected in 2005 — has brought to what was South America's poorest nation. Poverty has been cut from 38.2% to just 17.8%. State revenues have climbed thanks to the nationalisation of Bolivia's gas industry — a key demand of the mass uprisings that overthrew Morales's two predecessors. The new constitution adopted in 2009 created a Plurinational state, empowering the long-oppressed indigenous community and enshrining key democratic and social rights. So why did the “Yes” campaign lose? There are three main factors that arguably tilted the scales towards a “No” victory. Firstly, there was a protracted campaign of lies, negativity and personal attacks by the dominant privately owned media against Morales and his government. Perhaps the most bizarre media lie was a widely circulated story of Morales allegedly getting a US$200 haircut — an apparent attempt to smear his humble image. The story eventually proved to be false. In the weeks before the vote was due to take place, another story was spread of an apparent case of nepotism involving Morales and his ex-partner. Morales was accused of providing personal favours to Gabriela Zapata, with whom he had been in a relationship until 2007, in the form of government contracts to Chinese firm CAMC Engineering, where Zapata was working. The president denied these allegations and called on the Plurinational Assembly and courts to investigate the matter. Morales was also falsely accused of appointing various members of his family to important posts within the government. This was a bizarre claim given that the rest of his family are largely apolitical —and his sister works as a nurse. Stories like these were largely ignored by Morales' support base, which is strongest among rural, indigenous and working-class communities. But in urban centres, they helped sway key middle-class sectors to the “No” side. Second, the opposition waged a protracted social media campaign on Facebook, Twitter and other websites in order to sway young and middle class voters. In the lead up to the vote, Plurinational Assembly president Gabriel Montano said the use of false and offensive blogs, memes and videos violated the principles of a “clean political campaign”. Gabriel Villalba Perez, an activist in the revolutionary youth group Generacion Evo, told Green Left that Bolivia's social media is largely dominated by right wing and opposition voices. The “No” campaign was able to use this to their advantage ahead of the referendum. Valeria Silva, a pro-government MAS deputy, told Green Left: “We as a movement and as a people are not used to this type and magnitude of lies and the methods by which the opposition has waged its campaign against the 'Yes' vote”. A third factor was the role of US interference. Morales himself said the opposition received substantial funds, as well as political and consultancy support, for the “No” campaign from the United States Embassy and several US-funded NGOs. US government-funded groups such as USAID and the National Endowment for Democracy (NED) have long been acting in countries such as Bolivia, Venezuela and Ecuador to undermine elected left-wing governments and assist the traditional right–wing elites. Renowned Argentine political analyst Atilio Boron said the US Embassy provided $200,000 in funding for the “No” campaign. Boron said that, for its part, the NED spent more than $7.7 million between 2003 and 2014 on funding over 20 different groups in Bolivia. Together, these factors undermined the positive message of stability and progress of the “Yes” campaign. It created a sense of confusion and uncertainty among the middle class and less committed voters, allowing the narrow win for the right-wing opposition. It is also important to recognise that the results of the sub-national and governatorial election results last year have had an impact on the level of support for MAS. In March last year, the MAS party was defeated in a number of major cities and important urban centres, including La Paz, El Alto, Cochambamba, Tarija and others. Eight out 10 biggest Bolivian cities were won by the opposition. MAS still won six out of ninegovernorships and two-thirds of all mayorships and local councils in the country, but the loss of these important urban centres dampened the level of party organisation across the country. Morales blamed those setbacks on the growing levels of corruption within the regional governments and branches of MAS. Accepting defeat, Morales promised on February 24 to continue working with the nation's social movements to strengthen the Communitarian Revolution and govern in the interests of the poor and the marginalised. The president also emphasised the need to regulate and combat false information pushed by the country's privately controlled media, which acts in the political interests of the Bolivian rich. The referendum also highlighted the importance of social media and the need for the MAS and its supporters to more successfully use it for political organisation and activism. The MAS has no significant presence on social media. Making social media accessible to MAS activists and social movement leaders could greatly help combat the campaign of lies and disinformation spread by the right. Without the ability to stand Morales the presidential elections when his current term ends in 2019, the MAS faces the challenging task of choosing a successor to lead the Communitarian Revolution project. I tis possible for Garcia Linera — a key theoretician of Bolivia's process of change — to run as president, but the MAS has yet to confirm such a plan. The defeat of the “Yes” campaign also comes on top of the wave of recent right-wing victories in Argentina and Venezuela, and an overall resurgence of reactionary political forces in the region. There is no doubt that the MAS needs to re-energise its social base in the rural and indigenous communities, rebuild networks of support and militancy among the urban working class, and, above all, find ways to continue advancing towards its stated goal of communitarian socialism.